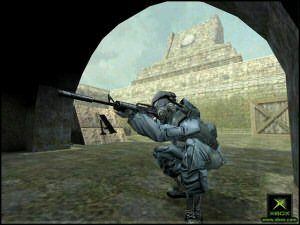 Starting as a mod of one of the greatest PC games of all time, Half-Life, Counterstrike revolutionised online gaming with it's class structure and the way that it forced players to adopt a team mentality as opposed to just looking out for number one the whole time. One of the first things that gamers should realise is that this title is really designed for online play. Playing with and against humans, not the bots who you will pit yourself against if you play this title in the single player mode. This might not bother some, but for others who felt the same disappointment when playing Quake III Arena on the PC against bots, it lacks a certain something. Myself personally, I don't mind playing against bots at all as I find it an amusing distraction but for you gaming purists out there it is only going to get annoying very quickly. So I believe that I can say that if you don't have an XBox Live subscription, it's worth every cent just to play this game. I am going to base almost the rest of the review around the assumption that you are going to go Live at some stage also. 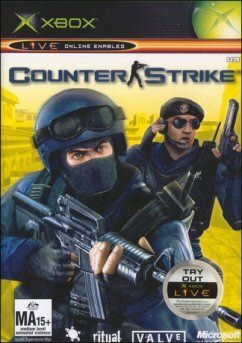 The first thing to note is how easy it is to get into a game of Counterstrike and get up and running. One of the things that I found surprising was how few players can actually get into a game at one time, with there only being 10 at a time. That said however, maps are designed for the smaller number of players and the general flow of gameplay is solid. It's apparent immediately that Valve only intended this game to be online pretty much the same as it's PC ancestor was with nothing really on offer in the single player department. It's the interaction with other human players that makes this game the loads of fun that I found it to be, and their reactions to your actions that make it as interactive and addictive as I discovered. The trick when playing is basically entering into a game where the other players are in the same frame of mind as you as there is nothing worse than a team game where one player has to be the hero. The key to getting through Counterstrike is to actively play the role you have chosen and use that character's strengths to further the cause of your team. The title kicks off with 18 maps and more on the way through downloading on XBox Live. All maps are beautifully designed for great gameplay that is fast and free flowing. Not only that it also caters for the base elements such as good cubby holes for camping and sniping. There will always be dudes who do this and although we whinge about them, they do make for very good snipers on teams who need overhead covering fire so long as they don't get caught. 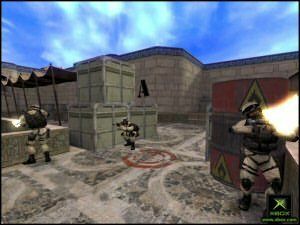 The general appearance of the game is certainly nothing to complain about although it does only look slightly removed from the graphics that we are used to on the original Half-Life engine. There's not enough of a difference to warrant a total wow factor but it must also be recognised that having slightly dumbed down graphics has resulted in a fairly trouble free playing experience when online with multiple players. There will be a occasional lag when a server is full but it's more often not a problem. Audio is rudimentary and mainly serves to identify gunshots and enemy activity. With surround sound doing the trick nicely in identifying where shots are coming from and allowing you to take cover as a result of the audio information being given to you. You can spice up the audio by using your own custom soundtracks when playing both single and multiplayer which was neat indeed. 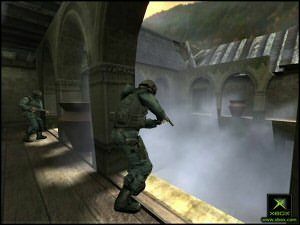 Counterstrike is going to be one of those titles that you will either love or just not care about due to the intense way that it's been designed. It's really a online game only with a skeleton to provide you some entertainment when you can't get the online game happening. I found both modes fun, however playing against real people is a real joy and something that you will get many many hours of fun out of. I can recommend this to all fans of first person shooters.